"Pittsburgh was the perfect stepping stone for living in a big city like New York. I went from living in the suburbs, to a small city, to a major city. I felt very prepared to step out of my comfort zone because of how well I adjusted at Point Park. As a student, I have taken every opportunity I could to build my resume in a way that would make me desirable to employers. If I hadn't started doing this my freshman year, I probably wouldn’t be where I am today." How did you land a co-op with Madison Square Garden in NYC? A huge factor that helped me land this co-op was the SAEM Alternative Spring Break Trip that Professor Teresa Gregory takes us on every spring. When I went my sophomore year, I talked to one of the student associate program directors and learned more about what they do for students. I applied last fall just to see how far I’d get and unfortunately, I didn’t receive an interview. However, this past summer I reapplied and did four phone interviews throughout June and July, which ultimately led to this co-op position. The Madison Square Garden Company hires around 60 student associates for their fall program. I am the only student associate within the entertainment PR department so I will be doing a lot of the daily office work and being an extra hand. Day to day, I update multiple different calendars with new shows released at our different venues (NYC, Boston, Chicago, and LA) since MSG PR handles all of the public relations for every venue. I also get to assist on a lot of the Rockette productions. I will be visiting different studios and media outlets with the team to help prepare the Rockettes for their station visits. I also assist with day of events at MSG, the Beacon theatre and the Hulu Theater and help coordinate with the media who wish to shoot/review shows for their respective outlets. Discuss the internship and career-related experiences you’ve had as a Point Park student. When placing me in a position, the student associate director said I was one of their top candidates. This is probably due to past experiences including my internships with Promowest North Shore (Stage AE), Bunbury Music Festival, PollstarLive! and the Pittsburgh Penguins. On top of my internships, I also held a position as a Pioneer Ambassador Coordinator in the Office of Student Engagement. In that position I had to hire, train and coordinate the team of Pioneer Ambassadors which showed my responsibility and understanding of good team work skills. With all of those experiences under my belt, plus having visited MSG during spring break, made them see me as a trustworthy candidate who is prepared to work within the live entertainment industry. I originally wanted to attend Point Park as a broadcast communications major, but quickly changed my mind after poking around on the website and reading more about the sports, arts and entertainment management program. Point Park was the only school I applied to so it was my first and only choice — and I have never regretted it for a second. My goals include working within a record label company, specifically Atlantic Records, and also hopefully going on a world tour someday as a manager. My SAEM degree has required me to take so many courses that deal with live entertainment and how to put myself out there so I have no doubt it will position me above other job applicants. Pittsburgh was the perfect stepping stone for living in a big city like New York. I went from living in the suburbs, to a small city, to a major city. I felt very prepared to step out of my comfort zone because of how well I adjusted at Point Park. As a student, I have taken every opportunity I could to build my resume in a way that would make me desirable to employers. If I hadn't started doing this my freshman year, I probably wouldn’t be where I am today. 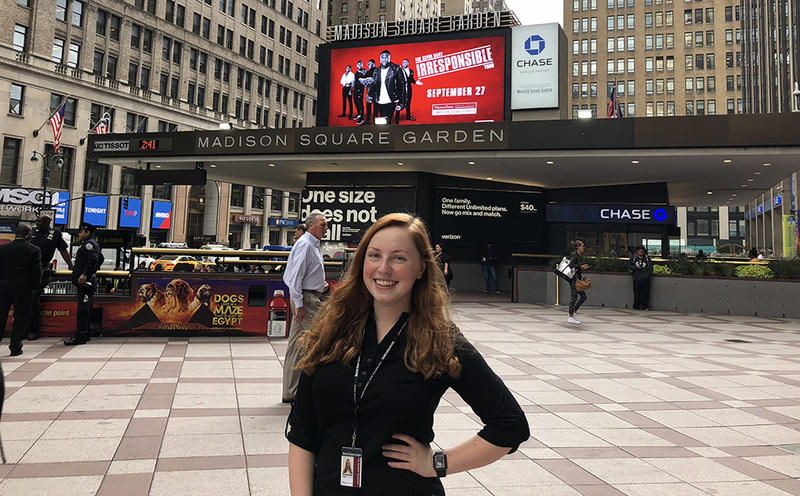 Also meet SAEM alumna Meredith Savage '14, who works for Madison Square Garden as a VIP services and hospitality specialist.